Remember to come along to Hatton Village Hall, Warwick on 3rd November! The Blighty Fair will feature vintage clothing and craft stalls! I will be hosting my own stall selling 1930’s, 40’s and 50’s clothing and accessories from my private collection, homeware, 50’s magazines and retro shoes. I am also doing some live singing, so pop in for a cupcake and gander. You may find some great Christmas gifts too! Posted in Events and Performances and tagged 1940's clothing, 1940's singer, 3rd nov, Blighty fairs, Blighty vintage fair, Christmas fairs, craft fairs, Hatton craft fair, Hatton vintage fair, kitten von mew, live singing, vintage clothing fairs, vintage clothing sale, vintage fairs, Warwickshire craft fair, Warwickshire vintage fair. Bookmark the permalink. As Britain pokes its meerkat head out of another recession hole, it got me thinking about how things like this effect people’s buying habits. As some people may know, I am a creative writer at a gift company in the week (no, I don’t know how I fit it all in either!!!) and in the recession’s lowest period, people didn’t stop buying, they just bought cheap novelty gifts which were affordable for the occasion and morale boosting too. I love collecting WWII novelties and took some photos of a few of my favourite bits and bobs. I started collecting music sheets and brooches, but thanks to my friend’s in America sending me some fantastically tacky specimens, this has now taken off! Fundraising was a huge part of the homefront. From homeless families to wounded soldiers, cheap and often fun items were made to aid the war effort and people’s dwindling spirits. We often put rose tinted glasses on when looking back at this awful time and although there was a lot of comradery, we cannot forget what a horrendously dire time this was for all involved. 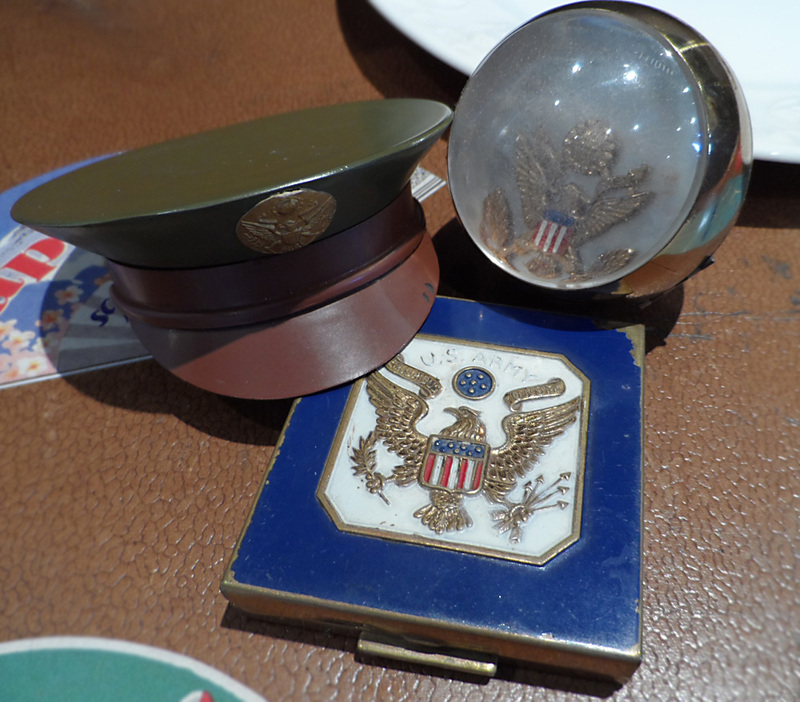 A novelty compact mirror in the shape of an officers cap may not be able to raise the opposition’s white flag, but I am sure it raised a smile! Whether bought by a soldier to send to his girl, or bought by a lady supporting her man’s efforts in the service, such things were a little light heartedness in a dark time. 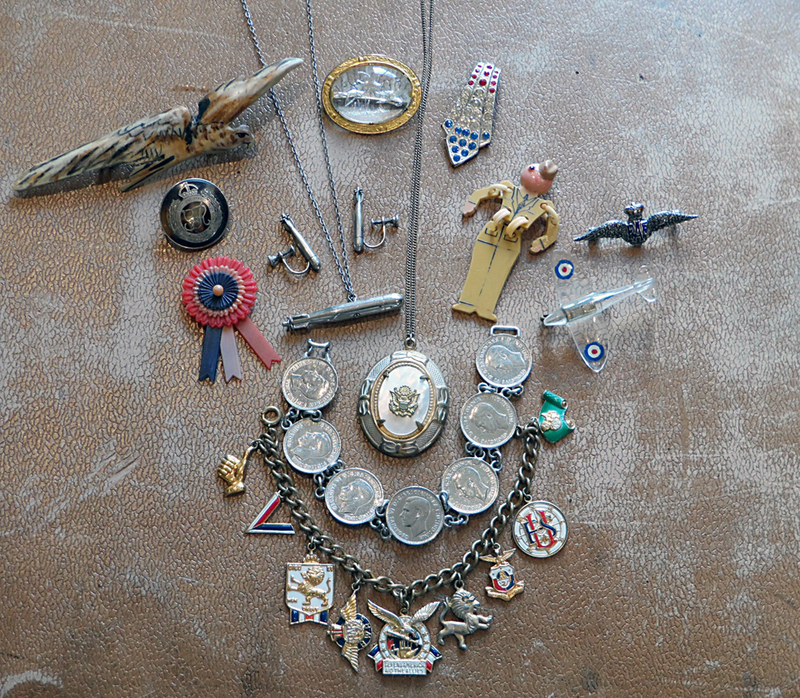 I have some fabulous 1940’s jewellery and am a lover of brooches. I have chosen some that are specifically of this era, but it can be difficult to tell when it comes to lucite jewellery as people were carving them well into the 60’s! In the war, these were generally made from the windscreens of crashed German aircraft and sold for the war effort or given to sweethearts. Reverse carving them, the shapes would be painted to give a real 3D effect to the flowers or objects. I have a lovely Spitfire one, of which I wear often! You will also see a wonderful Bundles for Britain charm bracelet which is a real stunner. Bundles for Britain was an American charity, raising money for us. You may come across the emblem, which is usually a rearing lion in a white shield with a red and blue striped ribbon. Another fantastic piece is my silver bomb set! A necklace and earrings in the shape of torpedos, they are subtle with a cheeky twist. Men’s jewellery was also a great novelty. You could get tin versions of the service rings for children and even some of the men’s sweetheart rings had lockets or secret compartments in them. We have a lovely one from America and you can see a V for Victory tie bar behind! As men were not often in civvies, there was no real need to produce ties and other novelty gifts for men as they could not be worn anyway, so hankerchiefs or other items that could be kept in a pocket were sent over, along with funny greeting cards or a letter record. These are like a vinyl record made of cardboard with a thin layer on the top. A message to a soldier or from a soldier to a family could be recorded at a shop and sent to the recipient in an envelope). I have a few of these and have played them, but as they were made to only be played a few times, they can be very difficult to hear depending on how worn they are. Now to tableware. The flame that sparked my love of these vintage novelties was a set of Victory Bomb salt and pepper shakers. 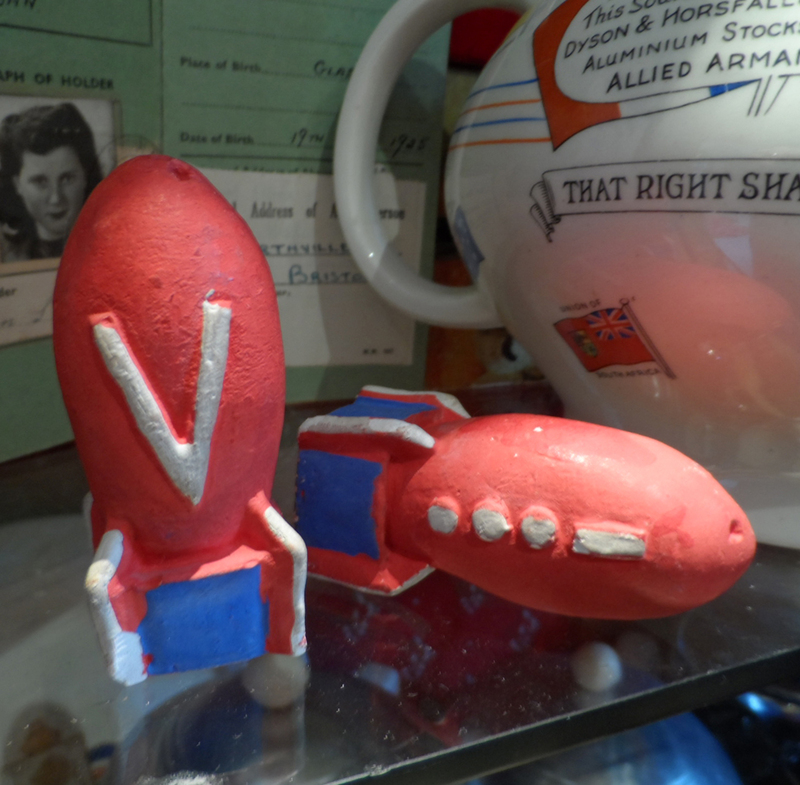 Made out of chalkware or plaster, they are crudely painted in cheerful red, white and blue! How can you not love these? Well…back then, they may have been thought of as tacky and vulgar, but just like Christmas cracker gifts, they were loved for a short period of time, which is what they are all about. 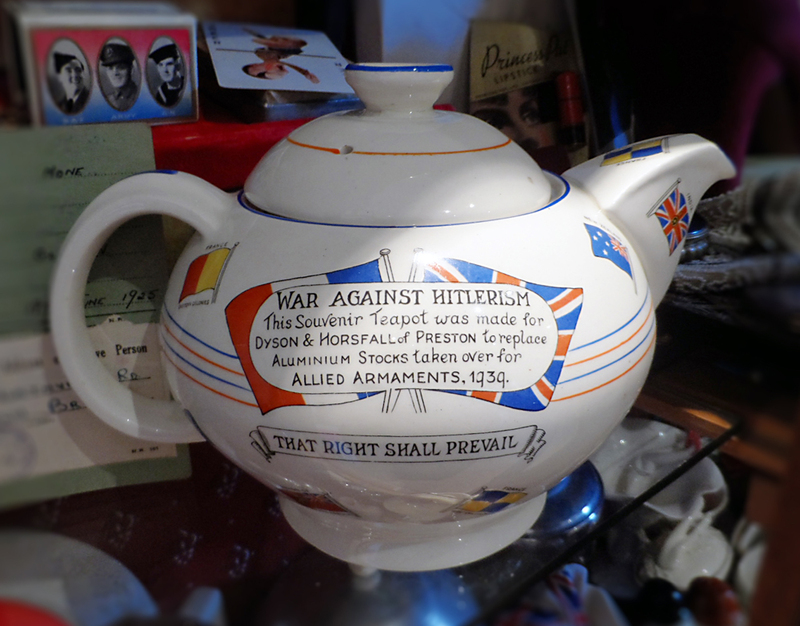 I am also now the proud owner of a War Against Hitlerism teapot! I have wanted one of these for as long as I can remember. They were produced for Dyson and Horsfall who surrendered their aluminium teapots to be recycled as allied armaments. It is covered in allied flags and of course the inspiring slogan ‘Liberty and Freedom’ on the other side. The Victory vase (also a favourite bought by our friends!) is another great example and a strong symbol of the time. Everyone recognises a V with …- as the victory sign and it has become a very iconic image. Doesn’t it just fill you with strength and pride just looking at it? Posted in Home and Leisure and tagged 1940's jewellery, 1940's teapot, kitten, kitten von mew, kitty von mew, war against hitlerism teapot, Wartime Novelty Gifts for Morale and Funds, ww2 homeware, ww2 jewellery, ww2 teapot, wwii jewellery. Bookmark the permalink. 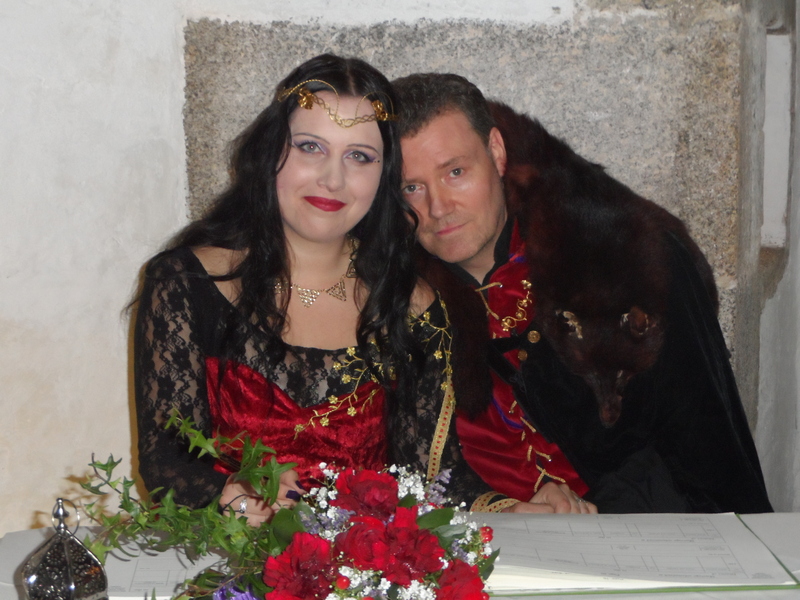 My gorgeous friends H P Saucy and Dai got married at St Mawes Castle in Cornwall, late September. 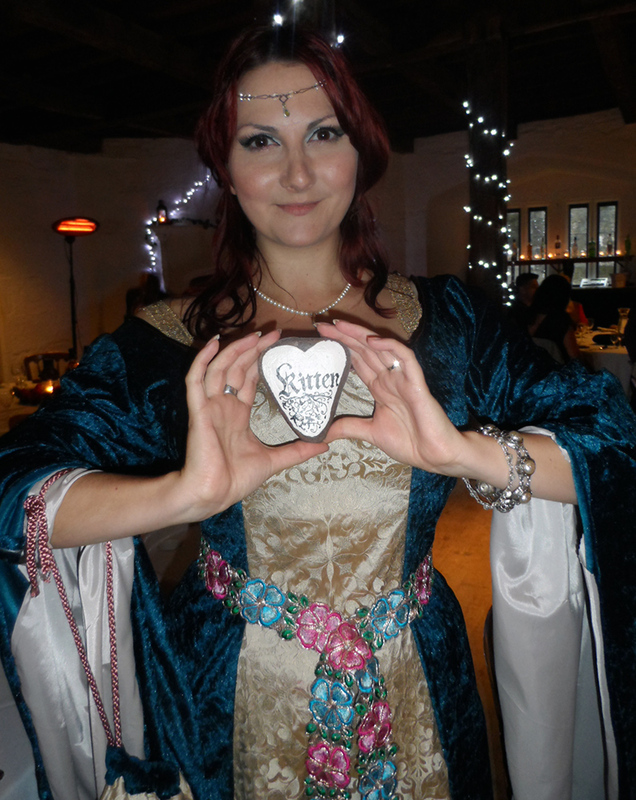 The theme was a Merlin/ Game of Thrones/ Medieval affair! I helped Helen with her styling, did her hair and makeup and also made Dai’s doublet! 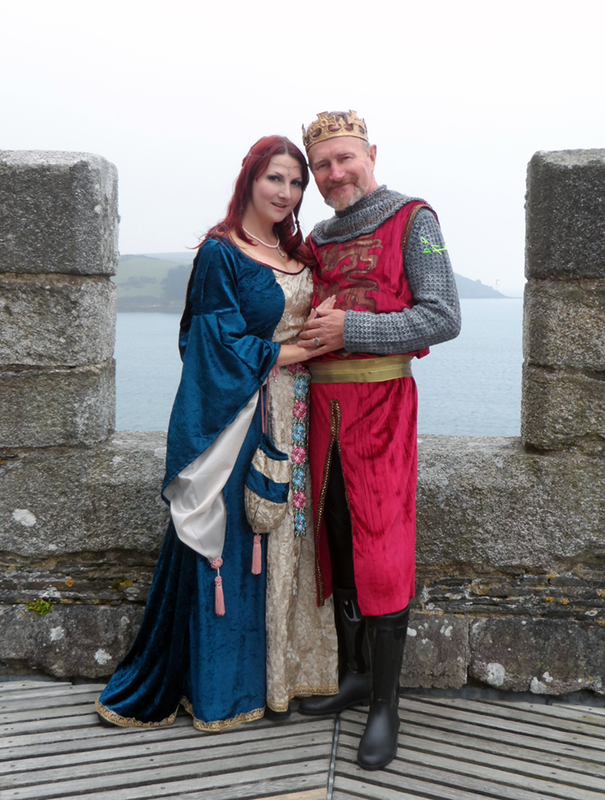 It was my first time making anything medieval and managed to make my own dress and matching bag AND Mr Moo’s Richard the Lionheart outfit too. Here are a few photos of the beautiful day… I know, don’t I look different?! 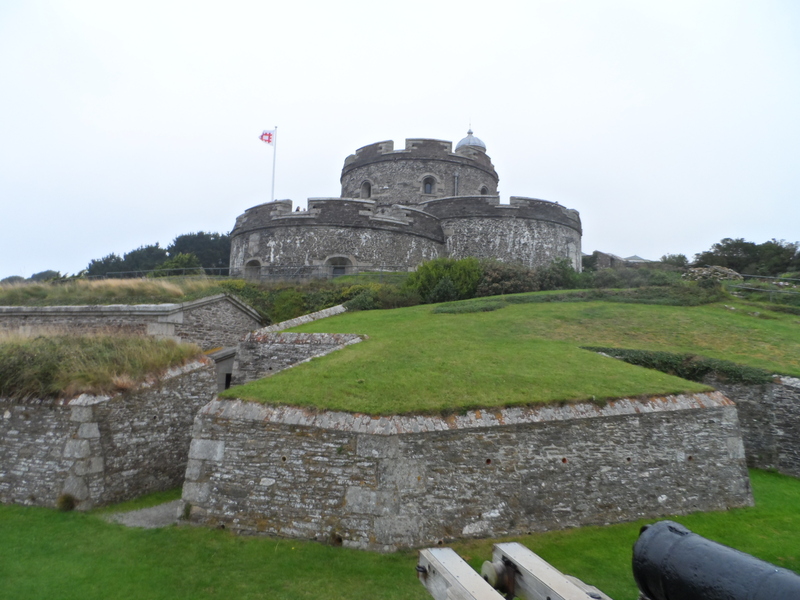 St. Mawes Castle in Cornwall – The wedding venue! Our outfits. I made my gown from crushed velvet and stiff silk with a woven pattern. I made Richard’s ‘chainmail’ cowel, which I knitted, rolled with silver paint and then finished by painting an antique gold line around the rim. The tunic is hand painted crushed velvet. 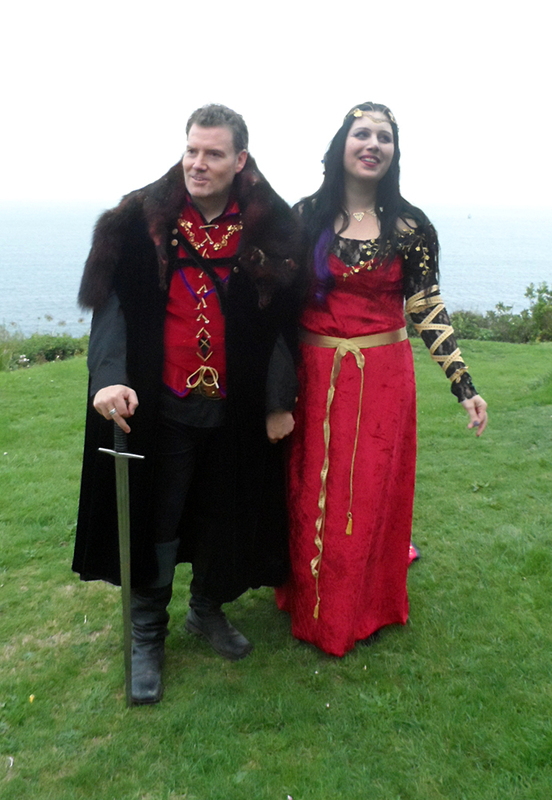 Game of Thrones inspired wedding outfits. You can just see the doublet I made from heavy duty cotton velvet with hand sewn brass findings and purple velvet ribbon. I also applied embroidered appliques to Helen’s gold and a gold belt with matching arm ribbon. Dai’s cloak is a 1930’s opera cloak (velvet) with a vintage fox fur. This is reminiscent of a Merlin character’s cloak. I know, too adorable right? My stone! Helen’s Ma collected heart shaped stones from Cornwall beaches and then Dai painted them all with people’s names. What a wonderful token of their day! Posted in Home and Leisure, Uncategorized and tagged dai cable, game of thrones wedding, helen prudhoe, helen prudoe, kitten von mew, medieval costumes, medieval dress, medieval gown, medieval wedding, merlin wedding, richard von mew, st mawes castle, unique weddings. Bookmark the permalink.